Marketers know how important organic search is and yet, SEO can be incredibly intimidating, especially to the non-technical marketer. I’m here to tell you that this does not have to be the case! Fortunately, a great deal of your search rankings has very little to do with the technical elements of your marketing efforts. Here’s the real story — no longer is SEO a game of “who can trick Google the fastest by stuffing the most keywords in your meta data? !” Even on-page optimization is becoming less important than it used to be. Google’s algorithms are becoming more and more like human readers — like the humans you want to reach out to about your product or service. The most important thing you can do for your search rankings is to create valuable content that people want to read. You probably know that content is important to your search rankings, but you might underestimate just how important it is. Content marketing is potentially the most important tool in the SEO-savvy marketer’s toolbox Tweet this! because of all of the ways that it impacts rankings. Let’s start with keywords. Smart marketers are also excellent writers and can create copy that is engaging to readers and also appropriately keyword dense. Don’t forget — search engines are trying to read your website like a human would — so write for readers, not for robots. In the same vein, readers love fresh content. This is why blogs are SEO gold. 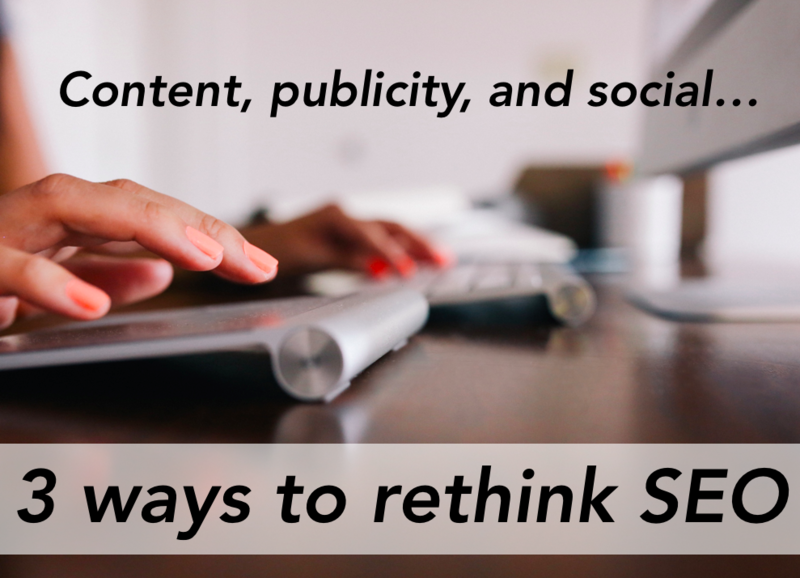 Blog posts help brands create living content that readers want to read and want to share. Tweet this! Another way that search engines are becoming less robot-like — the types of keywords that matter. No longer are single or even double word phrases as effective. Keywords with 3 – 4 (or more!) words are the most effective. These are called long-tail keywords and they are powerful because they are highly targeted for your prospects. For example, say you sell boxes — “moving boxes” might get a lot of searches but not a lot of conversions. But “where to buy large moving boxes in atlanta ga” is going to get you traffic that will convert. Your brand and publicity across the web are some of the most overlooked elements of SEO by today’s marketers. Unfortunately, this is a big mistake. Recently Moz surveyed 128 SEO experts who reported that brand-related and brand-driven metrics are on the rise. Rand Fishkin, Founder of Moz, summarized this portion of the report by saying “if you’re not building a brand on the Web, that could be seriously hurting your SEO, maybe to the same degree that not doing on-page optimization is.” Many marketers are spending all of their time building their brand on their own websites, blogs, and social channels, and not building influence, credibility and publicity elsewhere on the web. If you’re one of those marketers, consider this your charge to rethink your strategy — think about investing in public relations and making time to build your industry leadership — your search rankings will thank you! SEO-savvy marketers are also very social-savvy. Social sharing is important — the more your content is shared and engaged with, the more Google takes note. Plus, Google is now indexing tweets, which is another indication of the importance of social media to search. One way to jumpstart your social engagement is to get your employees involved in being ambassadors for your brand online. Another important thing to note is that social media profiles are often one of the top results when searching for a company’s brand name, so the content of your social media is highly relevant to your brand’s image Tweet this! . Finally, many marketing experts are arguing that social is the new SEO because social media channels are search engines themselves. This is why a strategic hashtag and social content strategy is very important to your brand’s success. So how does your SEO strategy measure up when it comes to content marketing, publicity, and social? Bonus: Check out how our client QASymphony started 2015 with a 33% spike in organic web traffic by using content marketing, publicity, and social media!